India Eye Care Center Finds Middle Way To Capitalism Founded in the 1970s in India to eliminate needless blindness, Aravind Eye Care has grown to 4,000 beds in seven hospitals — and its surgeons are among the most efficient in the world. The hospital system conducts 300,000 surgeries a year, and about half are free. At an Aravind hospital in Madurai, a city on India's southern tip, the waiting room is packed. A clinical assistant calls out the names of patients, and they're escorted to examination rooms. This hospital alone screens around 2,000 patients a day — and tour guide Shawas Philip says this day is busier than usual. "We might break that record today — of the number of patients that are seen on a particular day. That's exciting," he says. 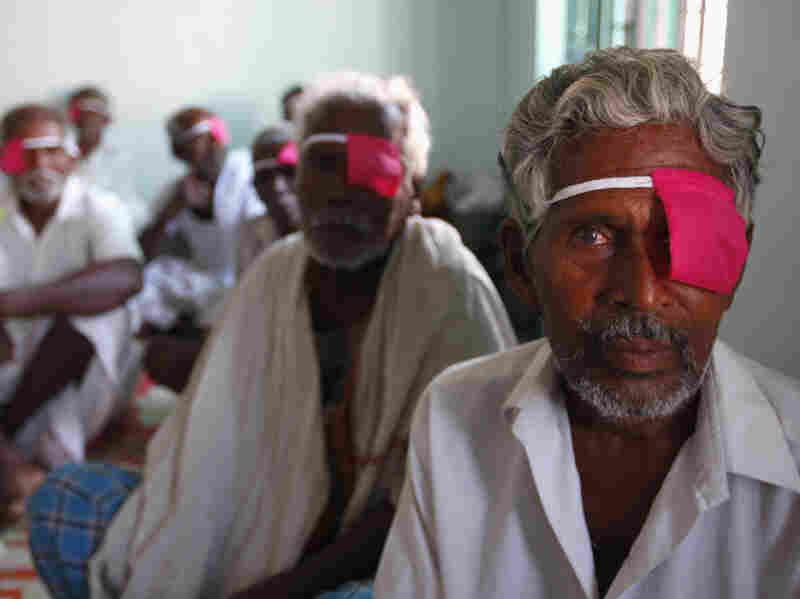 Patients sit after their cataract surgeries at a hospital of the Aravind Eye Care System in Madurai, India. Aravind is used to breaking records. But it began modestly in 1976 with an 11-bed hospital. 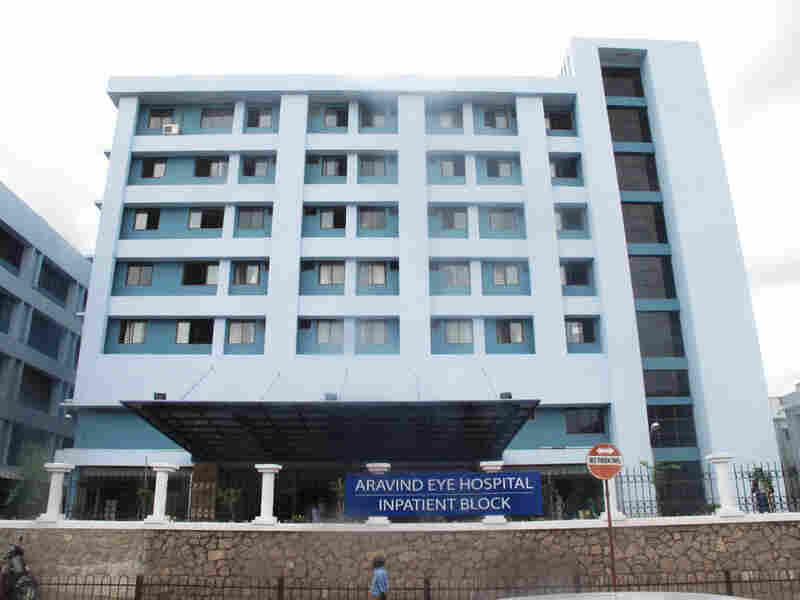 Aravind Eye Care System now has 4,000 beds in seven hospitals, most in the southern Indian state of Tamil Nadu. 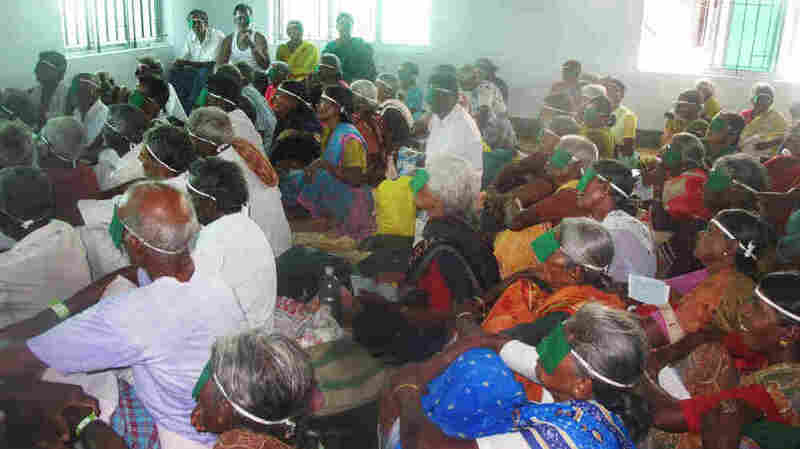 It was late founder Dr. G. Venkataswamy's goal to eliminate needless blindness. About 45 million people in the world are blind. About 80 percent of them could be cured through surgery. Dr. "V," as he is known, founded the organization on a deep belief in the spirituality of service. But Aravind embraces its mission by pursuing efficiency the way Goldman Sachs pursues profits. That's obvious in the operating theater. Dr. Hari Priya, scalpel in hand, looks through a surgical microscope into the eye of a cataract patient. "This is called a phacoemulsification procedure," she says. "This is considered the gold standard in cataract surgery across the world." Aravind Eye Care System conducts 300,000 sight-restoring eye surgeries a year — and about half of them are free. R.D. Thulasiraj, a top Aravind official, says that early on the organization embraced the simple idea that if it wanted to have a real impact in reducing blindness, its surgeons needed to work as efficiently as possible. "We want to make sure they're not idle because we didn't get our act together," he says. "They're not waiting for a patient, they're not waiting for a staff — they're not waiting for a lens." That attention to process has made Aravind surgeons quite possibly the most productive in the world. In total, the number of sight-restoring eye surgeries that Aravind Eye Care System conducts each year is 300,000 — and about half, or nearly half, are free. "Compared to India, we're probably four or five times as productive as an average surgeon," Thulasiraj says. "If you compare to the U.S. or many parts of Africa or Latin America, it could be a factor of 10 to 15 times more productive." Aravind's surgeons average about 2,000 operations a year. The average for eye surgeons in the U.S. is 125. The push for more efficiency forces down the average cost of a surgery for Aravind. But that doesn't mean quality is sacrificed. Aravind surgeons have just half the number of complications that the British health system has for the same procedure. That high quality allows Aravind to attract patients who are willing to pay market rates. Then it takes the large profit made on those surgeries to fund free and subsidized surgeries for poor people — like K. Karuthagangachi. Karuthagangachi, 49, lives in the village of Alanganallur, about 15 miles from Madurai. One of Aravind's 36 small satellite eye care centers is located just a few steps off the village's bustling main street. 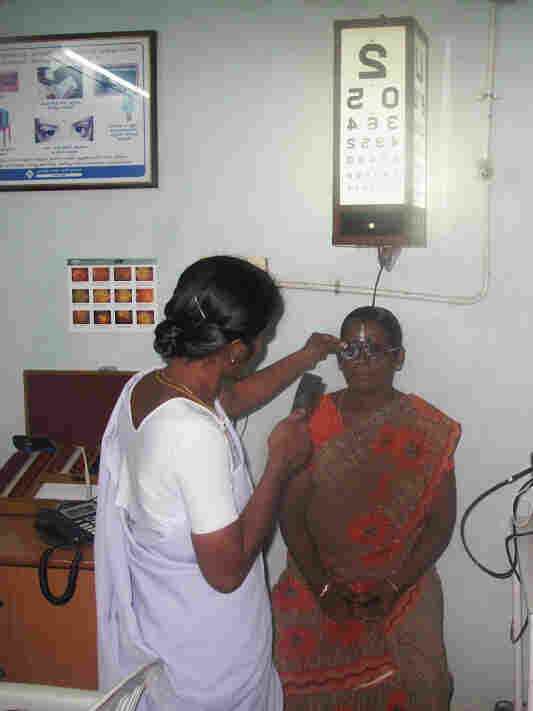 A woman receives an eye exam at one of Aravind's 36 small satellite eye care centers, in the village of Alanganallur, about 15 miles from Madurai. Karuthagangachi wears her salt-and-pepper hair pulled back and has an easy smile. She says when she developed cataracts, she lost sight and her job as a document writer filling out forms like birth certificates and license applications. She had no income, she's unmarried, and had to depend on friends to support her. The cataracts clouded her vision so much that she couldn't recognize people. She lost her confidence and mostly stayed at home. After two years, her friends finally convinced her to visit this eye center, which confirmed she needed cataract surgery. She had no money to pay, so Aravind did surgery on both of her eyes for free. It was a total success. She says "it was like seeing a new world," and she was very happy. She also got back her job as a document writer. Dr. Aravind Srinivasan, the director of projects at the organization, says it's only possible to provide free surgeries on the scale that Aravind does by running an operating surplus, like a profit-making company. That's what Aravind manages to do, even though it's legally a charitable trust. "I think traditional charities start with a lot of goodness in their heart," he says. "They're emotionally connected. That connection we had. But it was always superimposed with business acumen." Fifteen years after it was founded, Aravind's ability to provide free and subsidized surgeries was being limited by the high cost and availability of the intraocular lenses needed for cataract surgery. That's not a problem most charitable organizations could overcome, Srinivasan says. "How do you expect a charitable organization, which is providing eyesight, to say, 'I'll go and manufacture lenses.' You don't think that way. You kind of look at it as a bottleneck or a wall, and keep complaining about it," he says. But Aravind attacked the problem with the help of an American social entrepreneur named David Green. Green had been helping Aravind collect donated lenses to be implanted in their cataract patients. But donations were averaging only about 25,000 a year. That wasn't nearly enough to meet Aravind's needs, and the lenses cost several hundred dollars to buy. So Green helped Aravind set up its own lens manufacturer on-site, a subsidiary named Aurolab. "Now today Aurolab sells, I think this year it will be 1.8 million lenses," he says. "So you can see that when you have a business model, an economic model, it enables something to scale because it's not dependent upon charity, which is fickle." And even more remarkable: By squeezing out profits made by middlemen in the production and distribution chain, Aurolab is now providing some lenses at the astoundingly low price of just $2. With cheap lenses available, the number of cataract surgeries at Aravind shot up dramatically. Green says the main thing he has learned doing this work is that there's a middle way to capitalism. "You can find a pathway, as Aravind has, to see how you can use your profit and production capacity to serve others," he says. "And I think that service to others is really the foundation of what Aravind does." That's the culture that was started by Aravind's founder Dr. Venkataswamy — and it continues to pervade the organization today.